This is a really unique build, I've always thought about building something similar, definitely gonna follow it! No, I'm not dead, but I took quite a few months off from the project while it was too cold in the unheated barn to work through the winter. Now that it's starting to get a bit warmer, I guess I have no more excuses not to start working on it again. "Dummy" shock in place for now until I figure out what spring rates to get for the QA1's. Welcome back, mainlandboy! Man, I've missed following your build for nigh on six months. Please stick with it and keep us updated; this car is so cool. And now for some Monday morning quarterbacking: your brace on the LCA takes care of the serious worry (that braking forces would fold the LBJ carrying channel aft, where the big hole is) and the overall coolness of the dropped shock mount made that hole well worth the trouble of external bracing, but I'm puzzled about the placement of that brace. ...so far forward? Could the south end of that tube (marked with the green arrow) been attached further south (more toward the rear bushing) without the tire hitting it at full left steering lock? PS--even if you say, "Yeah, that's a good idea," don't do it! This is a car that should be on the road ASAP. Thanks for your comments! It would have been much easier to place the lower shock mount on top of the LCA like what is done on most Locosts, but that would have forced the upper shock mount to be higher than what looked aesthetically pleasing. Regarding the placement of the brace you pointed to with the red arrow, your assumption of why it doesn't intersect the main tube further back is exactly correct. 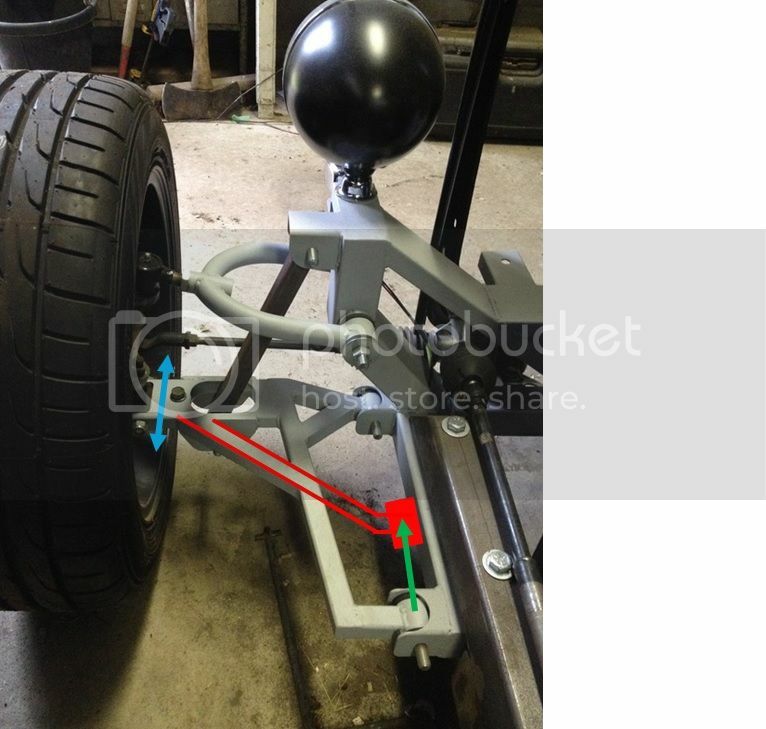 The point marked by the green arrow was as far back as this brace could intersect the main LCA tube to allow just enough clearance between the tire and this brace under full steering lock. Wheel offset and width come into play here, so I made sure to have the intended wheels/tires installed before I made this brace. Or move the south-end inboard pickup forward so that it's a straight shot by the brace tube. That additional width of the lower A-arm doesn't improve the strength because it'll flex at the green arrow. It is tough to build an lca as good as the oem when trying to duplicate the oem attachments for interchangeability. There are several companies making them for miatas but they are not nearly as light as the oem arms. Ain't that the truth, Mv8. Particularly for Miatas, which adjut their alignment via moving the lca chassis attachment bushings with eccentric bolt thingies. If the lower inboard pickup points are too close together, an additional strut brace would be needed anyway, as is the case in some production cars that have an additional link connecting the outer end of the LCA forward to the body to prevent fore/aft movement of the LCA. 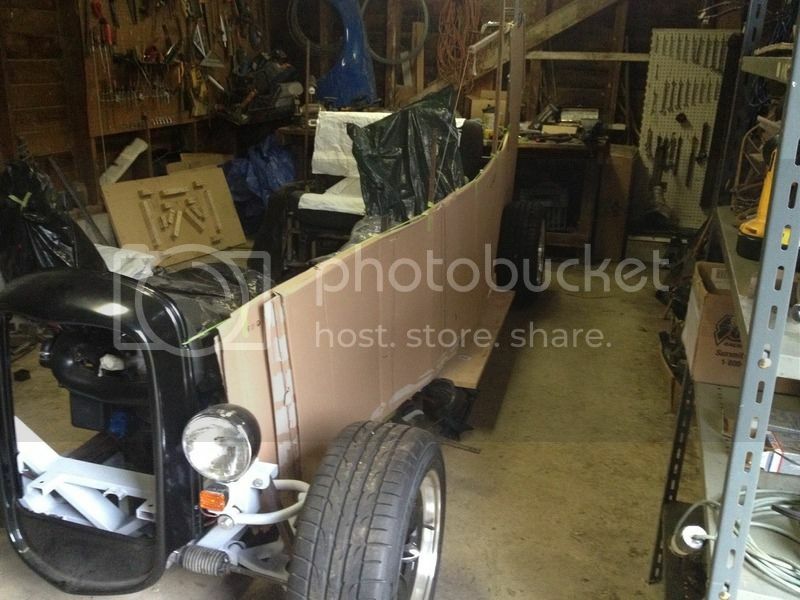 Hi Jack, the frame rails (including the kicked up section in the back) are made from 2 X 3 X 1/8 wall ERW. This car is going to be a bit of a porker compared to my Locost, but that's okay. This car serves a different purpose. Thanks for the info. That's pretty much the traditional modern hod rod chassis stuff; I was wondering if you'd maybe figured the car would be enough lighter with the Miata driveline than the 'Murrican V8 to go for 14 or 12 gauge (.083 or .109) instead of 11 gauge (.125). And I hear you the different purpose; it's sure no further off the beaten Locost track than, say, me getting into ultramilage. Man, I'm sure glad you're logging your build here so I don't have to check out HAMB every day. 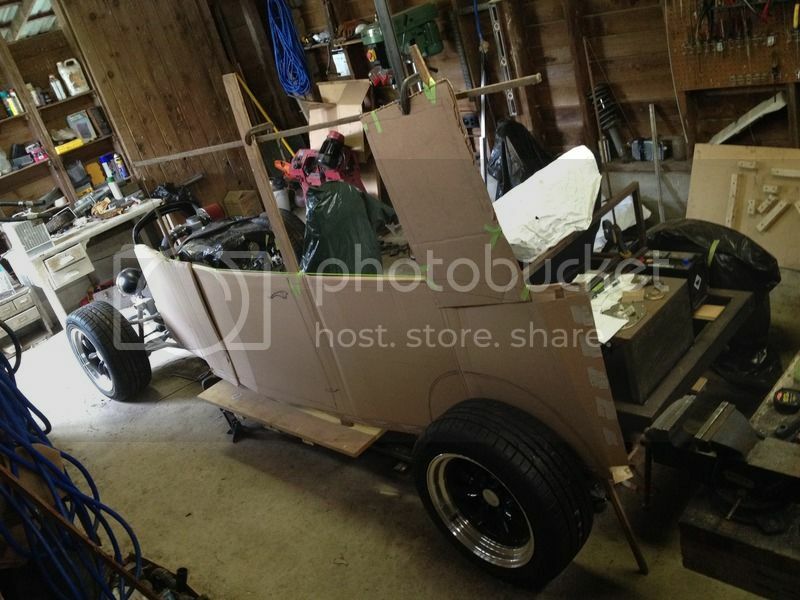 I temporarily attached some cardboard pieces to the side of the chassis to get an idea of how the body will look. Note the ornate Sharpie marker door handle. That is going to be terrific! Also wanted to say thanks for taking the time to post part numbers and where you sourced them... makes it super easy for the next guy that needs that bit to go hunt it down.. I like how you frenched the door handles. Very smooth. There are two rows of three bolts holding the Miata rear subframe to the chassis. How far apart are those rows (the right row and the left row) from each other? 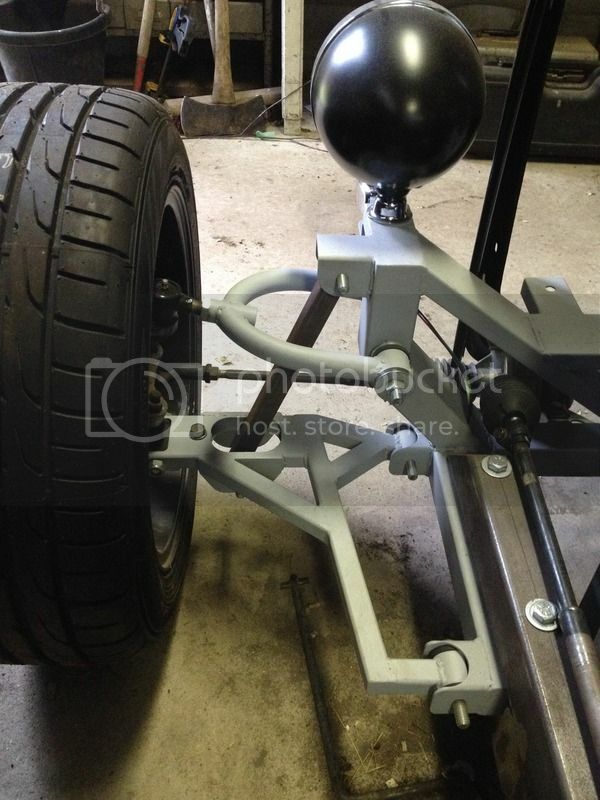 Also, how far are the forward holes of those rows forward from the axle? And how far are the front hole from the back holes? And while we're at it, how high is the top of the subframe (where it bolts to your chassis) from the bottom of your chassis? I'm not home right now or I'd measure one myself. I'm loving your build. Your willingness to start afresh on the chassis was brilliant.